Just want to double confirmed that is this data output feature available on xbox console? 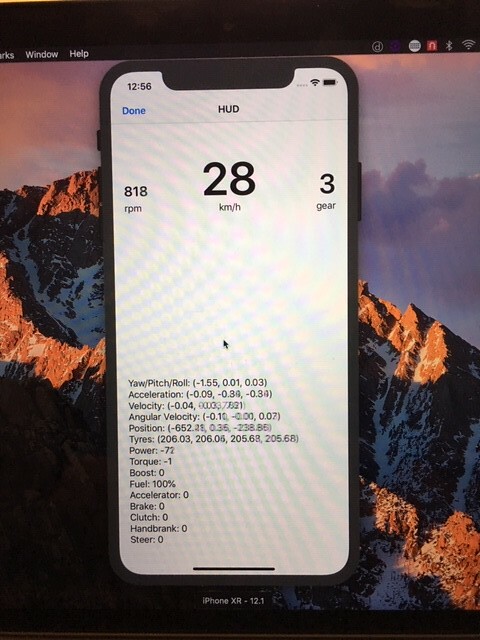 Hi all - I've created an open source Swift library to read the data from Forza for use on iPhone / iPad / Apple TV. It's still a little rough and needs some work (and some parts may not yet work), but if anybody wants to submit a pull request, feel free! Is anyone aware of a stand-alone motion simulator for the Xbox One X that makes use of this data-out? I've spoken with Igor at DOF Reality and their systems can work off the data out from the Xbox if you put a PC in between, but that kind of defeats the purpose (why not just run Forza 7 on a PC at that point?) Given how fast the cost of this technology is dropping (6-axis cockpit for under $4k), it would seem like someone could just build a dedicated piece using a Raspberry Pi. I get that it's a small market...but the same segment of customers that would drop $1,300 for a Fanatec Forza Motorsport Racing Wheel and Pedals Bundle for Xbox One would be willing to drop a few grand for a full-motion cockpit. I know I would. Yes, I get that the PC is better than any console and maybe someday I'll make the leap to a PC and 3 monitors or a VR headset, but meantime, I like the simplicity of a console. Anybody else in this thread agree? I've finaly got my shakers to work with SRS/FM7. First don't forget to install the "EnableLoopback" utillity like it says on the SRS website, download link is in the text of the FM7 info. To have this app work on my Win 10 I've had to set the properties for the app to: Compatibility Win 8 and run as Administrator for all users. On the Security tab I've set Users to full control. Last thing in FM7 data output type should be "dash". Hey this is great, I'm working on building a website that uses this data to help players tune their cars more effectively. Will future turn10 games incorporate the data out feature? If so, will it be the same structure as the one laid out above? Thanks for sharing S **** yQPZ....much appreciated! Again, thank you! Will keep testing and also see how I can change some things around. *NOTE - some data had negative numbers (HP/T). I'd also like to have ability to change units...(ex. MPH). How can I get edit? Thx! i've tinkered around with the data out stream and created a JavaFX-based dashboard. It's of course far from finished, but feel free to improve upon it. [...] i've created a small data-out relay (meaning that it receives the data-out stream and forwards it to another PC). by the way: you can use the relay for your other dashboards as well as this simply forwards the UDP stream. Today, I released a new version, now including all September-patch data out fields as well as some minor fixes. GREAT job with this...and, EASY to use. Thanks for sharing. I am not a "coder" (more of a "wanna-be"....lol....), yet, will tinker a little bit with it. p..s It would be great if under the "Information & Settings" tab, one could select Units (English/Metric)!! I finished my new sim rig a couple months ago and I just installed the new Fanatec V2 rim which freed up some space to install my 7" tablet above the wheel base which works perfectly. I am using Simdash which syncs up very nicely with Forza with the exception of the tach/shift light. I assumed that each car would send the data out to the app based on max RPM and would adjust as needed. That is not what is happening. I have car A with say a 15,000 redline and I setup the app to flash at say 95% of max RPM. Works perfectly. The F1 style light I am using light up through Green, Red, and Blue; and the shift light goes off accordingly. Am I missing something in the setup to allow Simdash to adjust to each car accordingly, or in Forza; or is this a programming downfall on F7's part that needs to be addressed. ...or is this a programming downfall on F7's part that needs to be addressed. I was asking similar questions about EngineMaxRpm value 7 months ago, but haven't gotten any answers that would help. I have my own custom software running rev lights and had to make it so that it detects the first time you hit rev limiter and calculates lights based on that. Maybe you are already doing it, but you could use the CarOrdinal, CarClass, CarPerformanceIndex, DrivetrainType and NumCylinders to create a cache of the RPM max value, and use that value as a starting point next time the combination comes up. Since engine swaps can change the maximum rpm, you should still check and update this cache, but at least it would prevent odd behaviour if you never rev to the max.